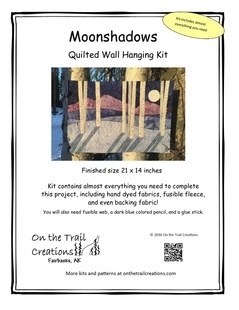 These videos are tutorials for some of the steps in the Moonshadows wall hanging kit. Click on the photo to order. Video on how to tack down the edges of the pieces with a glue stick to keep them from scooching! This one shows how to mark the placement of the tree shadows. This one shows how to do the stitching and coloring in of the shadows.